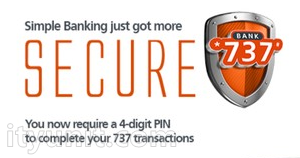 Mobile banking on GTBank using the familiar *737# USSD code has been criticized lately for the security vulnerability it exposes its customers to. Previously, you could complete a transaction using the last 4 digits of your ATM card. So, what if someone gets hold of your phone (with your registered line in it) and your ATM card? Your money is gone! To prevent this, GT Bank has introduce the latest security feature which allows you to complete any transaction on your mobile banking app or USSD code by using a Security Pin known only to you. To use this new feature, you have to create a new PIN once which you will be using. - Confirm the 4-digit and it is done. Remember, all USSD codes for mobile banking are still valid, you only need this new security PIN at the last stage before the transaction goes.